Dubai: Any form of misuse of a computer/smart device or an electronic network/system could fetch the violator, if found guilty, a lengthy jail term and/or a fine as hefty as Dh3 million. “Now that the law has termed all kinds of misuse of social media as a criminal offence, including threatening, impersonation, solicitation, we should appreciate and highlight the Dubai Police’s efforts where they proved that they are strong enough to reach the persons who commit the cybercrimes regardless of their experience and have built a very strong division for such crimes,” she added. Families should keep an eye on their children to prevent them from being exploited on the internet by a third party and should explain to them the risks of misusing social media, she advised. “Meanwhile, I approach all the civil society organisations to play a vital role in generating awareness on all types of cybercrimes through seminars, speeches and brochures,” Showq said. Advocate Yousuf Al Bahar, of Al Bahar and Associates, says cybercrime happens when “technology becomes a criminal instrument”. “Cybercrimes may be defined as the crimes which may be committed against individuals or groups with a criminal intention to intentionally smear the reputation or corporeally or incorporeally harm the victim, directly or indirectly, through the modern communication networks such as the social media networks, internet (chat rooms, instant messaging and emails) and mobile phones (SMS and MMS),” he said. “Such crimes may threaten the country’s security and its financial safety. This kind of crime incorporates a lot of issues such as hacking, piracy, violating copyright, publishing pornographic photos, attempting to seduce some people to sexually exploit them and illegal trading (such as narcotics trading). It also includes breaching the other’s privacy through illegally using confidential information,” Al Bahar said. Cybercrimes are not limited on individuals or groups only, but also countries, as they includes the crimes of espionage, financial stealing and many other crimes across borders’ crimes, he added. “State-related activities, which target another state, may be described as “electronic warfare”. It is well known that the UAE has recently witnessed a huge technological and economic revolution, through which business has been notably developed. 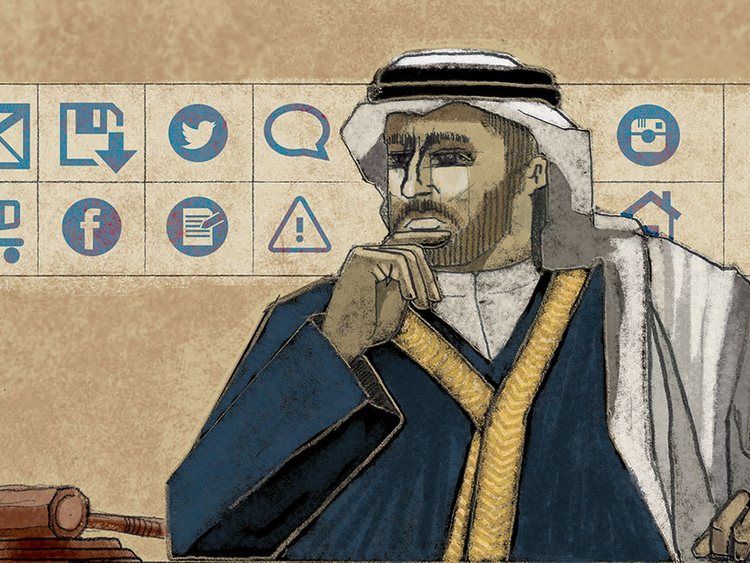 According to many international and Arabic agencies’ ratings, it has become the top ranking Arabic country [UAE] in the field of using computers and internet … hence that urged its officials and policy-makers to introduce amendments to the cybercrime law,” concluded Al Bahar.